How to create an Executive Sous Chef Job Description? 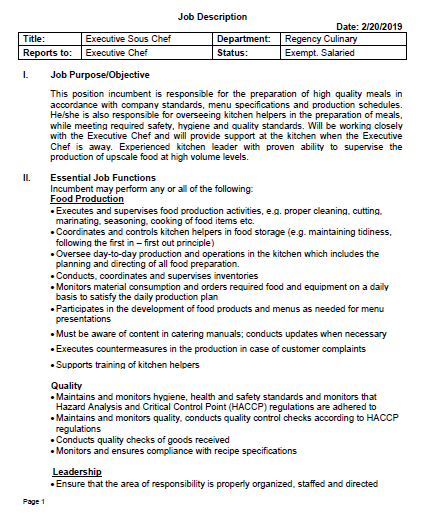 An easy way to start is to download this Executive Sous Chef Job Description template now! Every day brings new tasks, emails, checklists, and often it is not that different from the work you have done before. Many of our day-to-day tasks are similar to something we have done before. For example as writing job descriptions for positions that are already in your company for a long time. A sous chef is responsible for supervising and managing food preparation in the hotel industry. The job entails preparation of high-quality cuisine that is tailored towards customer tastes and preference. A sous chef ensures that a particular brigade adheres to high standards in the preparation of diverse dishes for different customers and observation of proper personal and environmental hygiene. In the absence of the head chef, the sous chef can oversee food preparation. Effective leadership and management skills are highly preferred in this kind of job. Moreover, knowledge in culinary arts and professional cookery are required for the position. Now we provide this standardized Executive Sous Chef Job Description to help you. If time or quality is of the essence, this ready-made template can help you to save time and to focus on what really matters! This Sous Chef Job Description template will perfectly suit your needs! Check it out now.